← Far Loop Trail NOW OPEN for Walkers! It’s been a wet, chilly spring but there’s plenty happening on the land. 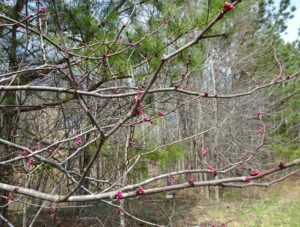 Hart’s Mill has ten ecosystems across its 112 acres and each one has its own character and species mix. 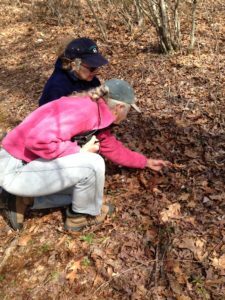 * When Margret Mueller and I got together to plan this nature walk, we decided to head towards the 13-acre splay of streams, trees, and wetlands along our eastern border. 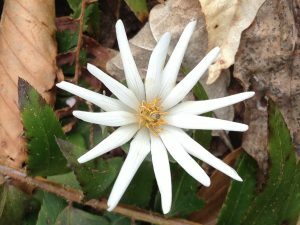 Bloodroot and Spring Beauty have been gracing the brown ground with bright white blossoms since late February. Flowering Red Maple trees dot the canopy with sprays of magenta. And with all the rain we’ve been having, the beaver dam displays are numerous and impressive. 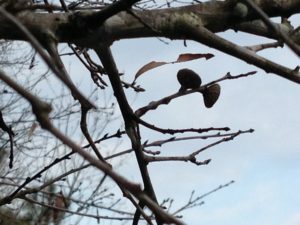 March 16th was a great day to take a nature walk. The day dawned clear and breezy and seven members met up at the pump house to start heading over to McGowan Creek. 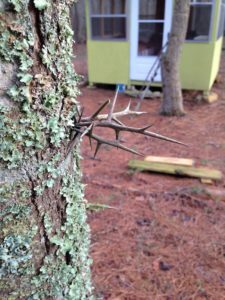 We took a detour to Hart’s Ease, where a Honey Locust festoons itself with fearsome thorns along its trunk and branches, with remnants of foot-long seed pods scattered at its feet. 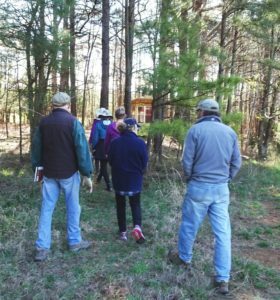 From there, we headed north towards Cob Haven, pointing out 3 species of conifers nearby: Loblolly Pine, Virginia Pine, and Red Cedar. At the top of the Far Field, we stopped for a visit with a lone Willow Oak, marveling at its tiny acorn caps and copious branches. Then we headed into the woods. There are 22 species of deciduous trees that I’ve seen on the land so far, but many are immature, unsuccessfully competing with the Loblolly pines planted in the late 1990’s after a clear cut of several large stands. Not so along McGowan Creek. Due to the steep slopes and regulations protecting wetlands, this rich strip has gorgeous mixed hardwood trees around 80-100 years old, including magnificent American Beech, Tulip Tree, Red Maple, Oak, and Hickory, while Ironwood and Black Willow proliferate nearer the creek. I took this picture a few days later, after a a heavy rain. The dam has been breached. I wonder what it will look like in a few days after the beavers take stock? Since trees are just starting to bud, the winding wetland expanse is still visible. McGowan creek, thickly braided with canals and swollen with beaver ponds, is a rich refuge for birds and animals alike. 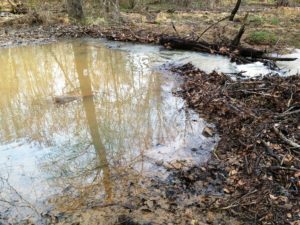 We walked up to the edge of an impressive beaver dam, the first of many dotting the stream like beads on a string. Beavers are nocturnal, but the effects of their tireless labors are visible by day in the way that their dams gracefully sculpt the wetland and by the many pointed tree stumps their extraordinary teeth leave behind. As for birds, I’ve spied wood ducks, geese, herons (blue and green), and egrets in this area, but they are very skittish and easily spooked. They steered clear of our group, but I know they’re out there for the quiet seeker. And speaking of quiet, the wetland is anything but this time of year. Gazillions of frogs and toads sing their hearts out in a concert that can verge on deafening. Though they were a bit shy with an audience, we heard spring peepers, bullfrogs, tree frogs and many other amphibious utterances as we strolled down the path. Margret, our fungi forager, pointed out Hexagonal Polypore (Neofavolus alveolaris) clustered along a few beech tree branches. The six-sided pores and golden color evokes a honeycomb. 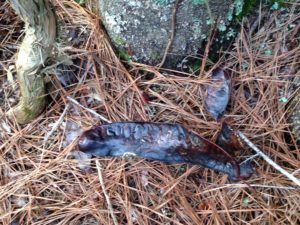 Some sources say it may be edible but its taste and texture leave a lot to be desired. Best to consume it in with your eyes only. Our group was full of questions, comments, and exclamations of wonder as we wrapped up our walk. We all felt energized and curiously connected after sharing this attentive conversation with the natural world, together. 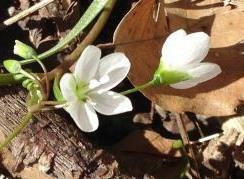 As the Spring unfolds, every precious part of our land will unwrap many flora-and-fauna gifts and surprises. 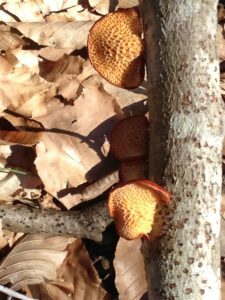 Each tree, animal, bird, flower, rock, fungus, and soil type has its story, gifts, lore, and singular beauty, and we’ll be exploring many more as our nature walks continue through the spring and summer. Keep an eye out for the next offering in April. If you have particular knowledge you’d like to share, or something you’d especially like to experience, please be in touch. We’d love to have you join us! 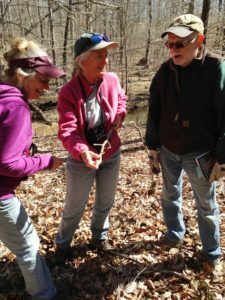 *For descriptions, see the excellent Forest Stewardship Plan prepared by the Eno River Association in 2014.